Often touted as quite a challenging resort, Verbier also offers a variety of slopes suitable for skiers of all levels and ages. We run a full programme of Verbier children’s ski lessons, from our 4yr old Whippersnappers up to all-mountain pros in our Freeride Team (up to 13yrs). And with the option to upgrade to one full day, including lunch, for all but the youngest children, your child will soon be showing you how it’s done! All our children’s lessons are based around fun and learning through play. And we’ll always finish on a high with a challenge or activity on the last day. Your child’s safety is at the forefront of our minds at all time. All children must be signed in an out and must wear a bib (with loops for the younger children to offer more support) to make them easily recognisable. And our lessons are planned carefully to ensure they progress in a safe and supportive environment. Our children’s lessons run in Verbier during peak weeks and on request, so contact us for availability if you’re travelling out of school holiday times as we may be able to offer children’s lessons. We run ski lessons for children from 4-13years, and groups are decided based on age, ability and experience. You can read more about the requirements for each group and select the most appropriate group for your child using our children’s level guide. After a supervised lunch, we’ll head back out for an afternoon of activities. 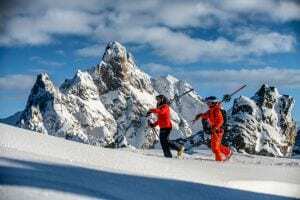 As well as more time with their friends and extra tuition, our Ride Tribe option offers you a full day’s skiing in the 4 Valleys or a long leisurely lunch. Bombers, Rockets, and Freeride skiers can join Ride Tribe. It’s a continuation of their group lesson, so they’ll finish at 15.00. The cost is a 150CHF supplement to the price of their group and includes lunch on both days. It’s not always easy to know the ski level of your child. Determining the right level early on is really important so we that we can ensure that your child is in the right group so they get the most out of the week and have an awesome time. So before your book your Verbier children’s ski lessons take a closer look at our selection of ski videos to help you decide what level your child is. What should my child wear for their ski lessons? All children in our groups must wear a helmet and protective eyewear (either goggles or sunglasses) for each lesson. We’ll then give them a bib to wear so they’re easily recognisable. We recommend children wear layers to keep them warm but can be removed as they get hot. Make sure you apply high factor suncream even when its cloudy as the sun reflects off the snow and children can get easily burnt. What will my child need for their lessons? As well as a helmet and protective eyewear, we recommend that for all lessons longer that 2hrs you give your child some money for a hot chocolate and perhaps a snack as we will take a break mid way. What lift pass will my child require? Whippersnappers and Wallabies will start on the Les Esserts beginner area which you can get a reduced price lift pass for. Your child’s instructor can then advise you when they will need a full Verbier pass. All other groups will need a Verbier pass for the week. Will my child need poles? All children other than Whippersnappers are likely to use poles during the week, if not on the first day. Poles are usually included with ski hire so we recommend that you bring poles which can be left by the side if they don’t use them to begin with. Whippersnappers will not require poles. What happens if my child gets cold, tired or feels unwell during their lesson? Our instructors are very used to teaching children and realise that they can get tired or cold easily. They will take that into account when planning their lessons and in all lessons longer than 2 hours we incorporate a break for just this reason. If however the child or instructor feels that they are unable to continue with the lesson we will contact you and ask you to collect them. This is why we require a mobile contact for all parents whose children are taking lessons with us. So please make sure you carry your phone during the day. For our smallest kids’ group – Whippersnappers – we have a maximun group size of 6, with a helper if they are 3 or more children. All other kids’ groups have a maximum of 8 children. Are the lessons taught in English? All of our group lessons for both children and adults and taught in English, with fluent English speakers. Will my child stop for a break during their lessons? With lessons longer than 2hrs we will normally stop for a quick break in a cafe halfway through the lesson – hence the recommendation for a few euros for a hot chocolate. Then once they’re refueled and they’ve warmed up we’ll head back out for more fun in the snow. What happens if my child is in the wrong group? We do our best during the booking process to ensure this doesn’t happen but if the instructor feels that your child is in the wrong group we will do our best to move them into a more suitable group for their size and ability. Are children’s lessons available all season? Our children’s lessons run in Courchevel during peak weeks and on request, so contact us for availability if you’re traveling out of school holiday times as we may be able to offer children’s lessons. 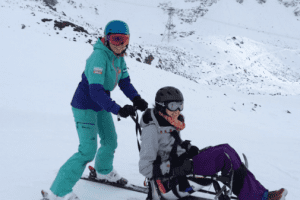 Why are New Generation children’s ski lessons so special? All our children’s groups have a focus on fun, and learning through a play environment. Children learn differently from adults and we use that knowledge and our experience to plan our children’s courses carefully to ensure each child is safe, has fun and improves, without feeling like they’re stuck in a classroom – they are on holiday after all! All our lessons are in English and ours groups are small and friendly. We know the importance of a well-timed hot chocolate and a shiny new badge at the end of the week. And we pride ourselves on our ability to make the first experience special so they want to come back year on year.